Diabetes A to Z, 7th Edition, contains the most up-to-date recommendations by the American Diabetes Association, presented in a simple, direct, and easy-to-understand format. Get answers to all your diabetes questions quickly and get back to living your life. This new edition contains a variety of important updates, including information on new medications and insulins, new nutrition recommendations to match the ADA's new dietary guidelines, an all-new insurance section discussing new coverage options and details brought about by the Affordable Care Act, and much more! 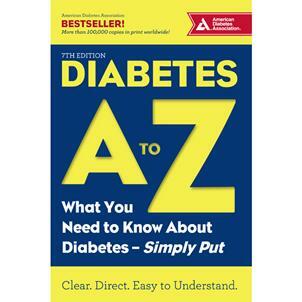 Appropriate for all people with diabetes and their caregivers, and backed by the credibility of the American Diabetes Association, this latest edition of Diabetes A to Z is the home reference every person with diabetes should own.